Cupboards Kitchen and Bath: Not sure of Wood Species? Pull out your iPhone! The marvels of the iPhone and iPad have yet to stop amazing me day after day... to think that it was only a few years ago that to talk to your best friend on the phone you were hooked to a wall in the kitchen where your Mom and everyone could hear your diabolical plans for your GI Joe's that day(So I'm not that old- At least I still remember phones with cords!). 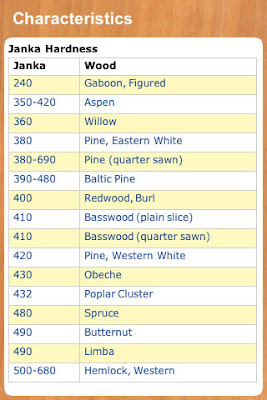 A couple nights ago on Twitter, I was "listening" in on #WoodChat and the moderator brought up that most customers are very unfamiliar with wood species. In semi-custom cabinet land, we typically deal with five or so primary wood species, but even then some clients have no prior experience differentiating them. Enter iPhone: Double Dog Studios has developed an app that does the identification for you. Simply named, I.D. 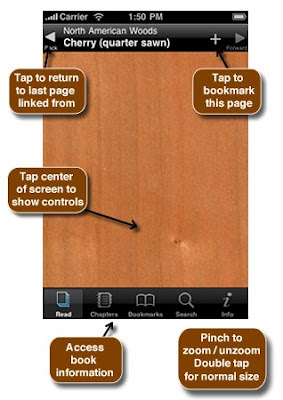 Wood, it now can identify up to 160 species of wood and give you tons of info. Ease of use is key- the screen shots are very clear. The additional info is perhaps my favorite part, from the Janka Hardness scale(below) to Botanical names, origins, sustainability and common uses. I.D Wood also includes lumber cutting techniques, a glossary of terms, lumber conversion metrics... even nail and pilot hole reference! 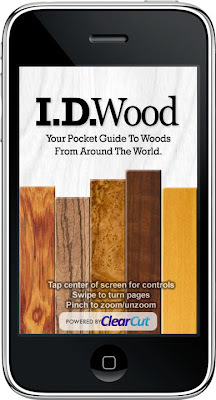 You can download I.D Wood for you iPhone or iPad here. Nifty!